Church Planting. Business. Leadership. Life. So Long Blogger, Hello WordPress! I've missed blogging and I intend to pick it up again. However, I've always been bothered that my ministry website and my blog were disconnected. So, since I've been building websites lately on WordPress, I decided to build myself a new site and blog! 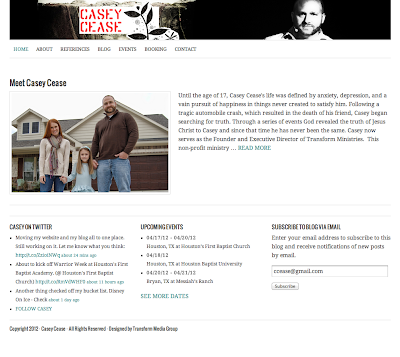 So you can go over to http://www.caseycease.com to keep up with my life and ministry, as well as read my blog. Also, if you are subscribed via Feedburner (E-mail, etc), then I'd encourage you to sign up there as I won't be transferring this feed over. A few months back I had the privilege of sitting with a few other pastors talking with Tom Nelson of Denton Bible Church. I had heard about his discipleship program for young men before, but did not know much of the details. One of my passions is discipling men to be strong followers of Jesus Christ, so I was very interested to learn from Tom. His program is called Young Guns and it is a year-long program geared towards training men from all over the country in areas of Systematic Theology, Bible Study Methods, Church History, as well as give them opportunities to serve around the church. That got me to thinking about ways that I could begin to intentionally invest in the men around me. Eventually, I would really love to start a similar one-year residency program, purchase a house or two for community living, etc., but since Christ Community Church is only 10 months into our weekly gatherings, I figured I'd find a guy or two to be my Guinea pig(s). So, I started throwing out an idea to a few of the guys in the church, thinking that I might be able to trap one or two of them into participating with me. However, I wanted to make it hard, because Tom mentioned that men need something to live up to. I decided that I would start a Boot Camp for the men of my church that meets on Tuesday, Wednesday, and Thursday mornings from 6am to 7am. We would study theology, bible study methods, some church history, and do some spiritual formation. To my pleasant surprise, we had 6 men commit to be a part of this from January until May! These guys committed to show up on time, and to pay a $5 late-fee if they show up late or a $10 no-show fee if they fail to show without prior notification. (I'm going to use this money for our end of the year party, but don't tell them!) They all committed, created a covenant that they agreed upon with one another, and we have been going strong. I'll keep you posted on how it goes, but for now, join with me in praying that these men are blessed and continue to grow in their love for Jesus. Church planting is a lot of fun, but also a lot of hard work. It is very easy to get wrapped up in doing things 'for' God and forfeit quality time for knowing God. It has been almost 2.5 years since I graduated from seminary, and for a season after that I needed a break from academic rigor, beyond sermon prep and devotions (QTs). However, I've recently been convicted that I have allowed myself to become 'intellectually flabby' to an extent. This is something that I take full responsibility for. I have no one to blame but myself. Sure, I could blame it on church planting, working several jobs, etc., but the reality is, I have allowed myself to be content with some time in the Word and that's about it. While I know that I am not loved by God because of what I do, but because of what Christ has done, I still realize it is important for me to press in to know Him more. Also, as some of you may know, I have a strong passion to reach men with the Gospel and to train them up to be "lion-hearted and lamb-like." I started reflecting on what type of man I want our ministry to produce and then had to ask the hard question, "Am I becoming that man?" Of course, we want to produce men who are like Jesus, that goes without saying. However, I don't want to set the standard as being nice guys who are a mile-wide and an inch deep. Last week I was privileged to sit in a small group with Tom Nelson, pastor of Denton Bible Church. He had come down to speak to the Houston Church Planting Network and took time beforehand to meet with some pastors. Tom has a strong track record of discipling men through his program called 'Young Guns' and really has a passion to make disciples. He shared how important it is to continually cultivate ones heart as a pastor and as a disciple-maker. Also, he talked about how he reads through the Bible each year by reading a chapter-a-day starting in Genesis, Psalms, and Matthew. He reads in it, marks it up, and has given a lot of them away. 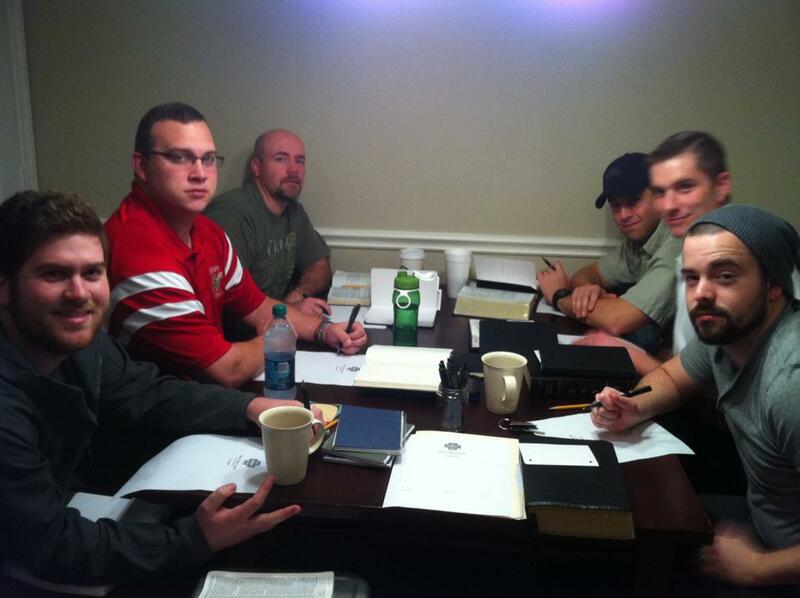 My ultimate goal is, starting in January, to get a few guys and meet with them Tuesday - Thursday each week from 6:00 am to 7:00 am going through the Word, Systematic Theology, and Church History. I thought that I might want to 'get back in shape' before I started leading other men through this process. I'm not sure if any men will sign up for this, but I figured that if that is ultimately qualities I want men to have (discipline, biblical fidelity, strong theology, and awareness of where we (the Church) have come from) then I might want to start living it as to not be a hypocrite. Beyond that, I realized that while I was still faithful in reading my Bible, etc., I was not near as sharp as I had been. I covet your prayers as I strive to develop these new habits. What steps have you taken to keep your soul fed, your mind sharp, and your pursuit of Christ consistent? Leave a comment and share. My good friend Dustin Neeley from cp4us.org interviewed me about 29 Coffee while we were at the Acts 29 Pastor's Retreat in Vail last June. Check it out! Over the last several years, I have been thinking a lot about the modern 'worship movement' that is taking place in the Church today and the emphasis on personal worship. There is such a huge emphasis on worship style, methods, songs, etc. that we can quickly miss the One whom deserves our worship. Furthermore, what has come of the corporate worship experience? If you think about it for a minute, you'd quickly realize that we bring a lot of people together to worship individually. Now, I know that people are encouraged to sing the same song, facing the same direction, and all, but is it just me or is there an increasing emphasis made on the experience of the individual rather than the glorification of Jesus? Plus, aren't we called to worship God as a people, not just as a person? Shouldn't individual worship be defined as our whole life and not just an emotion (see Romans 12:1-2)? I'm not trying to be just another negative voice in the worship discussion. However, I am convicted that I have not been viewing the call to corporate worship appropriately. We need a little more of 'us and God' and a little less of 'me and God'. I think we've gotten pretty good at 'me and God'. This trend also emphasizes the lack of community in the Church today. In my experience, there appears to be more authentic community being had at coffee shops and bars, than in the church. Why is that? Perhaps there is a connection between our view of worship and our view of community? The idea of community in the world is a group of people with common interests that derive benefit from one another. However, isn't there something more that Christ calls us to? For instance, aren't we to care for widows and orphans? What if that even means more than paying their light bills and feeding them? What if it means that we do life with them with the aim of encouraging one another to love and good deeds (see Hebrews 10)? I'm not great at this, so this is just as much about me as anyone else. What are your thoughts about worship? 29 Coffee: Drink Coffee. Plant Churches. Church planting is one of the greatest ways to evangelize an area, and by God’s grace we are seeing many new churches planted each year in the US. However, one of the common barriers to planting new churches is the lack of monetary support. Enter in 29 Coffee which was created to serve Acts 29 Church plants throughout the US by selling quality coffee and giving the net proceeds to church plants. As an Acts 29 pastor myself, I know first hand how difficult it can be to raise the necessary support needed to plant a new church. 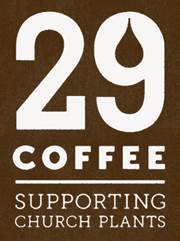 I became aware of 29 Coffee in the fall of 2010 after searching for different avenues of fundraising available. The first time I visited the site, I thought it was a brilliant idea. After all, how many people do we know who drink coffee? How many churches do we know who serve coffee on a weekly basis? What would it look like if those in the Kingdom would be missional even through the coffee they buy? If you stop for just a moment and think about the potential that this could have on church planting as a whole we all could make a difference just by purchasing our coffee from 29 Coffee. You see, for every $10 you spend on a bag of coffee, $5 goes towards church planting! For ever 5 lb bulk bag you buy, $10 goes to church planting. While those numbers might initially seem minimal, there is huge potential of what we could accomplish together. We need your help! There are several ways that you, your family, and your church can get involved. First, you can connect with us on Twitter and Facebook. You can spread the words to your friends, family, churches, and online. You can purchase coffee at www.29coffee.com or even setup a monthly subscription. On average, a family. Goes through 2-3 bags of coffee per month, so our subscriptions are very convenient. You can begin brewing 29 Coffee at your church or organization. We would love to have your partnership as we work together go plant more churches for the sake of the Gospel of Jesus Christ. NOTE: I now serve as the National Director for 29 Coffee. This article was originally written as a guest post for this blog. I know this post will be way out of order for my Evernote series, but I am way too excited to not share! 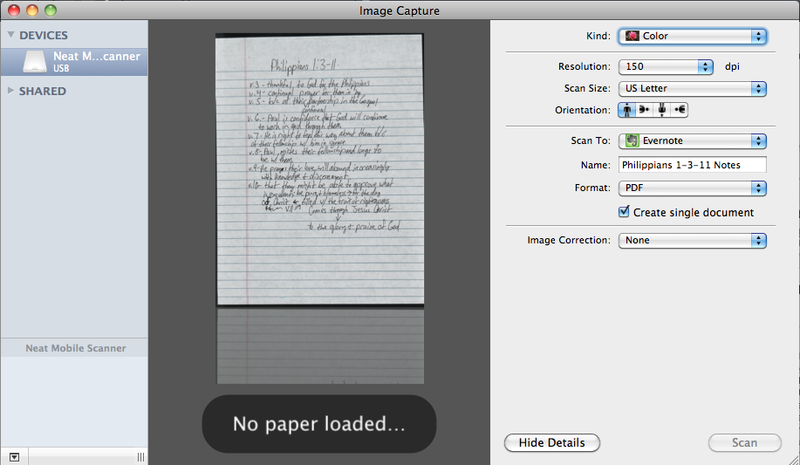 There is a way to utilize a 'non-supported' scanner to scan directly into Evernote on a Mac. I have a Neat Portable Scanner, and before today, I had to scan into the NeatWorks software, export as a PDF, and then add to Evernote. However, I found this on the Evernote blog and have tried it out. It works! If you are just getting started with Evernote, then I highly recommend you purchase Evernote Essentials to save you days of learning. Buy it now, thank me later. Follower of Jesus, husband, father, son, brother, uncle, pastor, elder, preacher, speaker, writer, friend, publisher. If you click links or ads on this site, there is a chance I might be compensated (like a few cents) for any purchases that come from it. I'm just sharing this to stay in line with the new Federal Trade Commission guidelines.